When using Sencha's, or extjs, charting capability, most likely your going to want to change the default color scheme. I was faced with this issue today and it's not documented as well as you'd expect. I had to piece together a few articles and I'm still not 100% it's the right way as it's using an undocumented config option. But I wanted to document how I did get it to work to same others some time. Sencha is very well documented and their examples are great. Here is the Pie Chart example we are going to be updating (using version 3.2.1). For those that don't know, extjs charts are based off of Yahoo's YUI charts which is also requires Flash. Not only is it pretty simple to create charts with extjs, but we already are using extjs so we decided to prototype some charts using it. 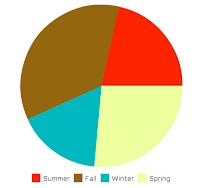 This produces the following PieChart. The chart it produces may not look the most appealing but at least we figured out how to change the colors. Again, I'm not certain this is the best way to accomplish this as the series config option isn't documented in 3.2.1. But by piecing together this PieChart question and this article, I was able to figure it out.